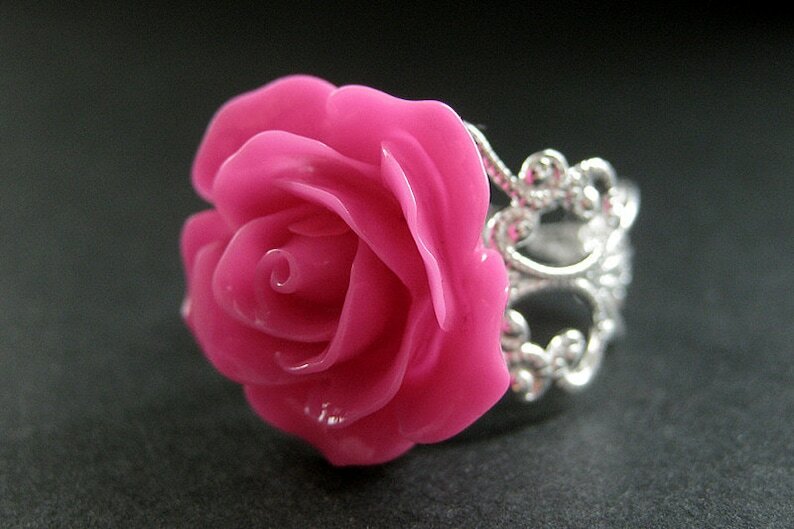 Hot Pink Rose Ring. Pink Flower Ring. Filigree Adjustable Ring. Flower Jewelry. Handmade Jewelry. A vibrant shade of hot pink resin has been used to create a delicate handmade resin rose that has then been set upon a filigree adjustable ring base in your choice of finishes in this romantic flower ring that is made to be adjustable from size 6 and up. The detailed filigree base for this handmade ring is adjustable, which makes this delicate rose ring comfortable no matter the size of the wearer's fingers (size 6 and up) as well as ideal for switching from finger to finger depending on mood or preference. There are also matching earrings! EASTER SALE Antique Pink Rose Ring. Pink Flower Ring. Filigree Ring. Adjustable Ring. Flower Jewelry. Handmade Jewelry. EASTER SALE Gray Rose Ring. Grey Flower Ring. Filigree Adjustable Ring. Flower Jewelry. Handmade Jewelry. Pink Rose Dangle Earrings. Flower Earrings. Silver Leverback Earrings. Pink Earrings. Pink Rose Earrings. Flower Jewelry. Handmade Earrings. EASTER SALE Peachy Pink Rose Ring. Peach Pink Flower Ring. Filigree Ring. Adjustable Ring. Flower Jewelry. Handmade Jewelry. EASTER SALE Baby Blue Rose Ring. Sky Blue Flower Ring. Filigree Adjustable Ring. Flower Jewelry. Handmade Jewelry. EASTER SALE Cobalt Blue Rose Ring. Blue Flower Ring. Filigree Adjustable Ring. Flower Jewelry. Handmade Jewelry. EASTER SALE Orange Rose Ring. Orange Flower Ring. Filigree Ring. Adjustable Ring. Flower Jewelry. Handmade Jewelry. EASTER SALE Tangerine Orange Rose Ring. Orange Flower Ring. Filigree Adjustable Ring. Flower Jewelry. Handmade Jewelry. EASTER SALE Turquoise Rose Ring. Teal Flower Ring. Filigree Ring. Adjustable Ring. Flower Jewelry. Handmade Jewelry. EASTER SALE Light Brown Rose Ring. Latte Brown Flower Ring. Filigree Ring. Adjustable Ring. Flower Jewelry. Handmade Jewelry. EASTER SALE White Rose Ring. White Flower Ring. Filigree Ring. Adjustable Ring. Flower Jewelry. Handmade Jewelry.